Finding gold nuggets with a metal detector may seem simple enough, but it can in fact be one of the most challenging types of metal detecting there is. It certainly seems simple enough; you swing your detector until the coil is over a gold nugget, the detector sounds off, and you dig it up. 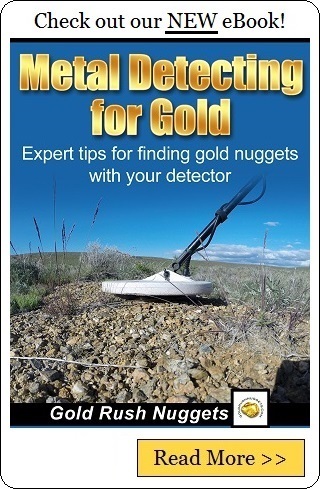 In reality, while it can be very productive, using a metal detector for gold prospecting can also be extremely frustrating, so let’s discuss a few of the challenges that you are likely to face when you start looking for gold with a metal detector, and a few tips that will help you get started on the right track. The first thing worth emphasizing is to use a metal detector that is specifically designed for finding gold. 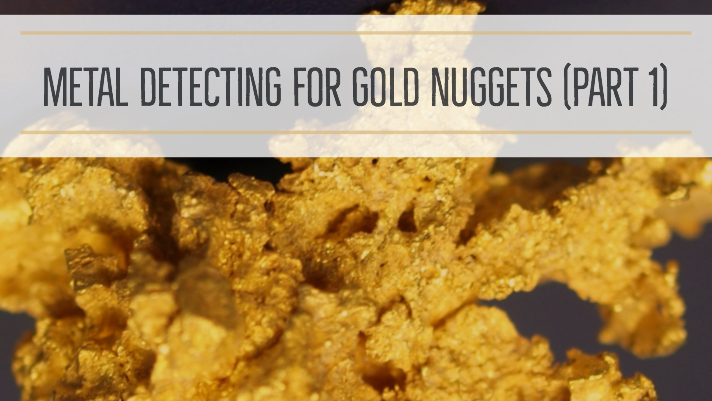 Just about all metal detectors can detect gold, and manufacturers will often claim that their detectors are good at finding gold, but the truth is only a select group is specifically designed for nugget shooting. The average detector that might do just fine locating coins in a park will probably have fits if you take it out to the gold fields. Areas that produce gold nuggets often have a unique set of challenges associated with them, so let’s discuss each of them in detail. One of the biggest problems with most gold bearing areas is the highly mineralized ground that is associated with it. Most ground contains varying amounts of iron, and gold is usually found in areas that have extremely high amounts of it. This causes that vast majority of metal detectors to struggle, as they will sound off constantly because they are sensing the minerals in the ground. The other pest that you will find in many areas is hot rocks, which are rocks that contain a high amount of mineralization that will make your detector sound off as well. A detector with ground balancing is absolutely essential, but still many detectors will have trouble with this, and it can be just about impossible to cancel out the chatter produced by the mineralized ground to be able to distinguish the difference between it and a gold nugget. Another problem that is common in many gold areas is high amounts of iron trash. The miners in the early days didn’t think much about leaving behind junk. Often they were camped right on their claims, leaving behind old cans, boot tacks, nails, bullets, shovels, snuff cans, and just about anything else you can imagine. High amounts of trash can sometimes be overwhelming, even to an experienced detectorist, but it is something that has to be dealt with if you want to be a good nugget shooter. Another thing that makes metal detecting for gold nuggets a real challenge is that the vast majority of them are very small. While we would all love to dig up those nice softball sized nuggets that we dream about, the reality is that most of the nuggets that are found with a metal detector are pretty small. We are talking little flakes that might be smaller than a grain of rice. So in order to successfully find gold nuggets on a regular basis we need a detector that is sensitive enough to find the small nuggets, while at the same time be able to handle highly mineralized ground and also distinguish the difference between ferrous trash and a gold nugget. So now that we have outlined the biggest challenges that we will have to deal with when looking for nuggets, let talk specifically about which detectors are best at dealing with these challenges. I will go ahead and outline some specific brands and models that have good reputations as “gold getters”, but everyone has their own opinions about what is best. Do your research, weigh the options, and figure out which is best for your needs. Without getting too deep into specifics, understand that there are basically two types of technology used in metal detectors today; Very Low Frequency (VLF) and Pulse Induction (PI). VLF metal detectors are an older technology, but are used in the majority of the detectors on the market today. They are best at locating small nuggets at fairly shallow depths. PI metal detectors are a newer technology and were specifically designed to detect larger nuggets at deeper depths. While they excel at searching deeper into the soil, they will miss small nuggets that a VLF will find. They are also much more expensive. In no particular order, some of the most popular VLF metal detectors are the Fisher Gold Bug 2 and Gold Bug Pro , Tesoro Lobo SuperTraq, Garrett AT Gold, Minelab Eureka Gold, and White’s GMT. All of these detectors are well respected for their ability to find small nuggets, as well as discriminate trash and mineralization. Minelab is by far the winner when it comes to PI metal detectors right now. They basically been the only show in town when it comes to high quality PI detectors, and they are by far the favorite of many serious nugget shooters. The older models include the SD2100, SD 2200 and GP3000, up to the most recent models which include the GPX 4500 and GPX 5000. The Whites TDI is another newer PI detector, but currently it doesn’t have near the following that the Minelabs have. Okay, so now that we have learned about good quality gold detectors and some of the obstacles that we will have to deal with, it is time to actually go out and find some gold nuggets! Check out Metal Detecting for Gold Nuggets (Part 2).